South Asia’s dense rainforests, spectacular mountain ranges and vast grasslands shelter some of the most unique animals on the planet, and you might be surprised to know the classic “Big Five” are not only found in Africa, but here too. The Big Five is traditionally made up of the African lion, African leopard, cape buffalo, white and black rhinoceros and the African elephant. Their asiatic cousins may not be as famous but one could argue they are more unique. Swap the African leopard for the elusive Snow leopard, the cape buffalo for the wild water buffalo and a few other subtle differences and we present: Asia’s big 5. Afghanistan was once home to tigers and cheetahs who roamed the lowland areas until the mid-twentieth century when they slowly began to disappear as war devastated this beautiful country. 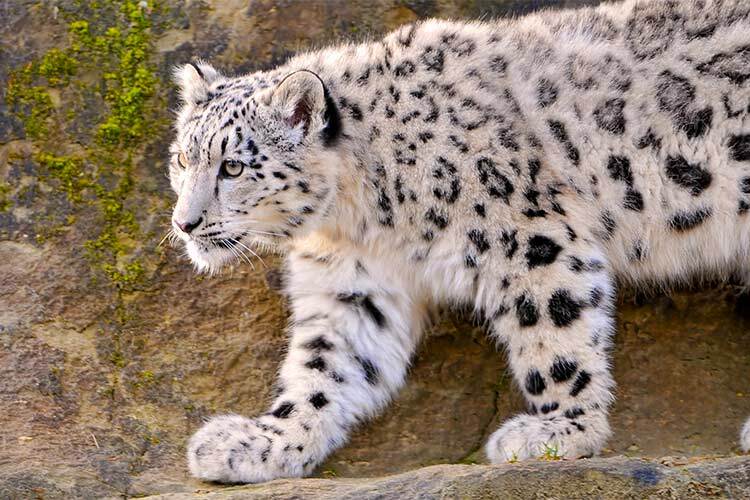 However up in the remote Hindu Kush mountain range, for the adventurous, snow leopards can still be found here. The chances of seeing this endangered creature however is unfortunately remote, of all the wildlife of South Asia, they are most likely the hardest animal to find. Snow leopards are hunted for their bones and fur and they often attack domestic animals which leads to conflict with the locals. If Afghanistan isn’t on your hit-list, which would be understandable! These elusive felines can also be found in the Himalayas of India, Nepal and Bhutan amongst a few other countries outside of South Asia. They are best tracked with a tour company as the chance of finding one on your own is slim to none. In addition, Nepal has a varied terrain with clear skies, lush forests, and high mountains and it’s here where you can admire the clouded leopard. Although similar in appearance, these cats have a different coat pattern to their African counterparts and are much smaller, weighing in between 25 – 50 pounds. They are said to form the evolutionary link between big and small felines and if you’re lucky you might spot one of these notorious climbers relaxing on the branch of a tree. Unfortunately this species are currently classified as threatened and although you can find them in South Asia you actually have a better chance finding them in southeast Asia in the forests of Thailand and Indonesia. Never the less if you’re in Nepal, India or Bhutan be sure to watch out for these beautiful animals as not many people have the pleasure of seeing them in the wild. 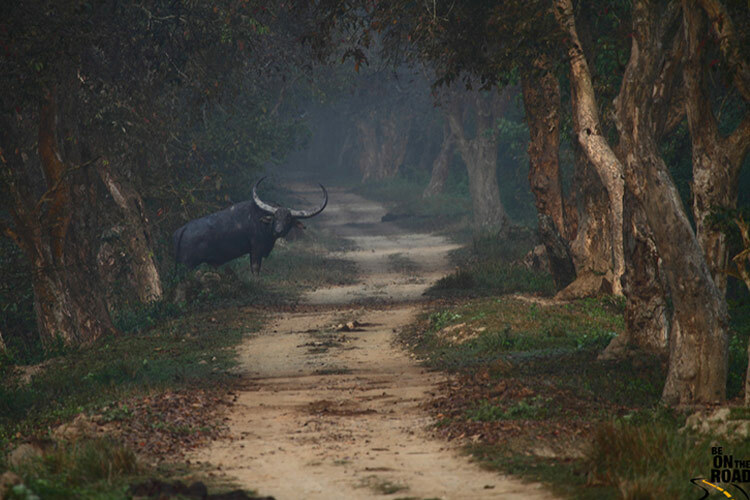 Of all the wildlife of South Asia, the domestic water buffalo is likely the easiest to find. It is for this reason we suggest seeking out the lesser known, wild water buffalo who are currently endangered with a population of around 3000. The wild water buffalo is larger than its domestic cousin, weighing in over a tonne and reaching up to three meters in length. 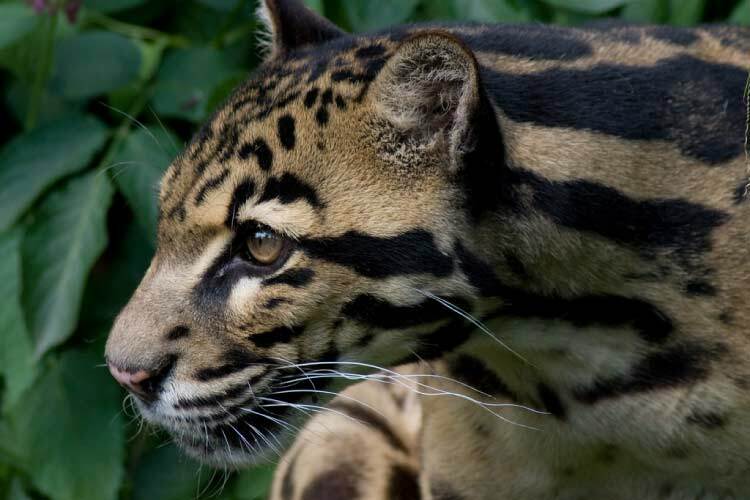 Although this animal is native to southeast Asia, they are now almost exclusively found in India, with small populations in Nepal, Bhutan, Thailand and Cambodia. There are several reserves where the animals are almost solely located, including the Kaziranga and Dibru-Saikhowa National Parks and one of the best ways to see them is to rent a jeep and comb slowly through the network of paths in these spectacular areas waiting for your chance to see these peaceful creatures. 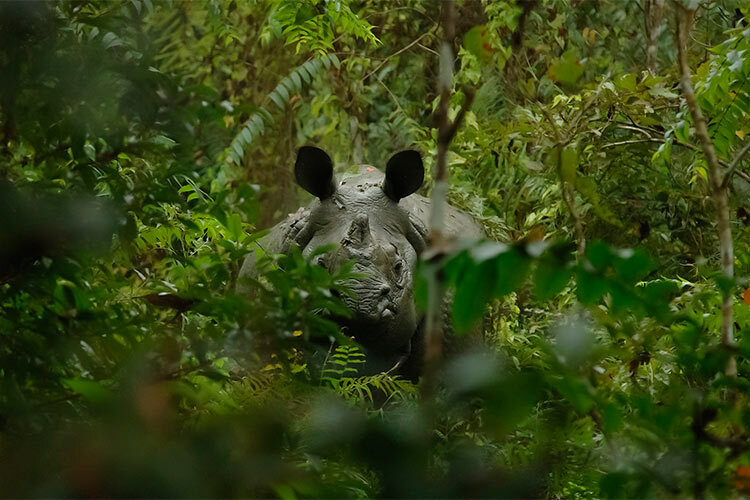 The One-horned rhinoceros is split into two species, the Indian rhinoceros and the Javan rhinoceros, the former of which populates a the regions of northern India and southern Nepal. Aside from only having one horn, the Indian rhino has several distinct visual differences from the African rhino including wart-like bumps that cover its upper legs and shoulders and it’s skin folds, which appear much more prominently, giving them a somewhat prehistoric look. These gentle giants are best viewed from the back of an elephant, and one of the best places to do this is the Chitwan National Park in Nepal. For the adventurous, take a jungle trek with a local guide and get up, close and personal with the fifth largest land animal in the world! In your quest to find the big 5 in Asia, you will undoubtedly bump into an elephant or two! 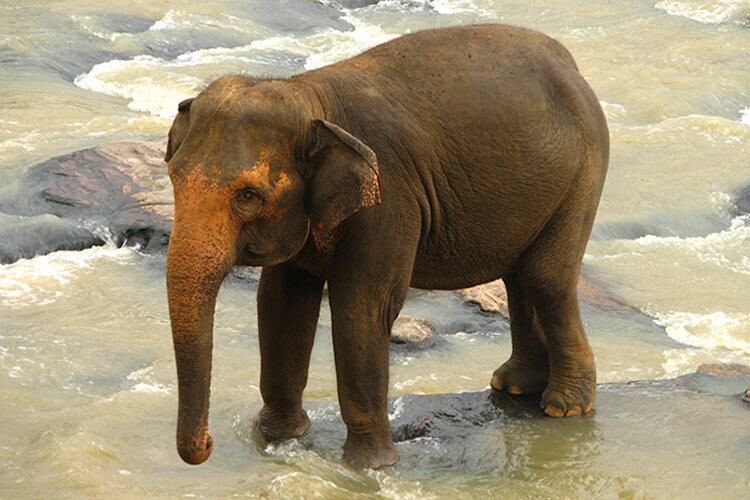 The Indian Elephant can be found throughout much of South and Southeastern Asia and are a popular tourist draw in Bhutan, India, Nepal and Bangladesh; the elephants are revered by the people of this region and considered to be holy. Much like our suggestion to find the wild water buffalo instead of the domestic water buffalo, we recommend heading south to Sri Lanka, where you will find the Elephas Maximus Maximus, the Sri Lankan elephant who are endemic to this country. The largest of the three subspecies, they are still smaller than the African Elephant but reach between 2 – 3.5 meters at the shoulder and weigh up to 5,500 kgs. There are several orphanages in Sri Lanka, dedicated to the conservation of this species and also one of the best places to see them. However if you want to see them in the wild, head to the Udawalawe or Maduru Oya National Parks. Surprised to find lions in Asia? The Asiatic Lion once roamed as far as northern Greece, however is now found exclusively in the Gir Forest National Park of India and are down to a population of around 500. 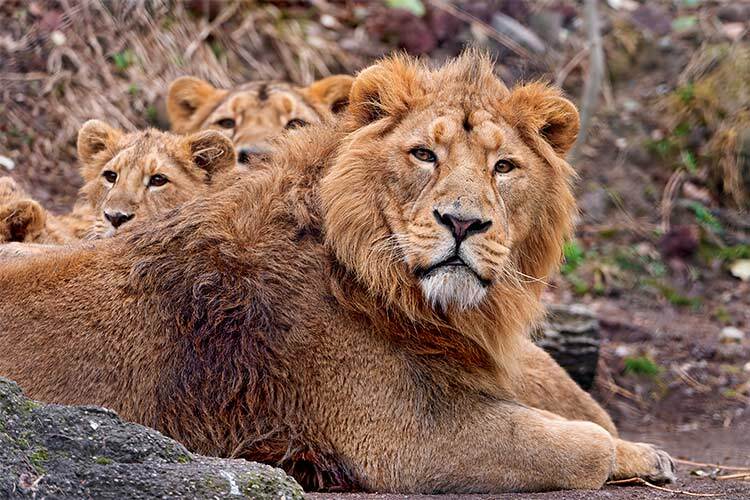 Visually they are separated from their African cousins by a smaller mane, although evidence shows that when kept in captivity in cooler climates this mane becomes much more prominent. The Asiatic lions live in much smaller prides than African lions with only 2 -5 breeding females per pride, interestingly this is due to the lack of larger animals in the area and therefore less lions are needed to bring down this smaller prey. These animals are currently classified as endangered, but much like the other endangered species in this area, there are several conservation organizations set up to preserve the species. Although not part of the African Big 5, it would be a travesty to cover the wildlife of South Asia and not mention Tigers! The tiger is the largest of all cat species, with adult males weighing over 300 kgs and reaching up to almost 4 meters in length. Unlike pride animals such as lions, adult tigers are solitary creatures and males can occupy a range of up to 100 square kilometres. Unfortunately tigers are hunted to a large degree in the wild, with their body parts sold for large amounts on the black market and used in traditional Chinese medicine. 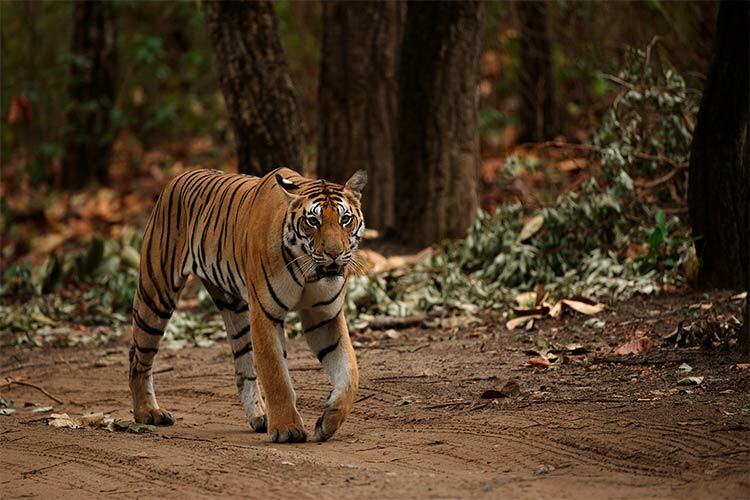 Although tigers can be found in much of southeast Asia, India is by far the best place to find them, with over 4 times the population of any other country alone. Watching a tiger in wild will be one of the most exhilarating experiences of your life and will give you an appreciation for how large and powerful these animals really are. Daily Inspiration for your next adventure! We're constantly researching every corner of the earth to find locations to blow your mind and inspire you to travel. Whether your looking for something exciting, adventurous, relaxing, luxurious, remote, interesting or just down right fun, we strive to bring you awesome content every single day.